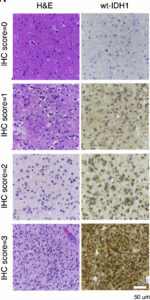 The scientists found that wildtype IDH1 was over-expressed in high-grade glioblastomas, as indicated by the immunohistochemistry brown staining on these tissue microarrays. Northwestern Medicine scientists have demonstrated that an enzyme called IDH1, which is overexpressed in the brain tumor glioblastoma, plays a significant role in cancer progression and may be a target for novel drug therapies. The study was published in the journal Cell Reports. 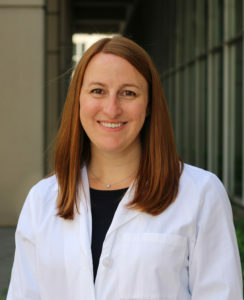 Andrea Calvert, ’17 PhD, a recent graduate of Feinberg’s Driskill Graduate Program in Life Sciences (DGP), was first author of the paper, and Alexander Stegh, PhD, assistant professor of Neurology in the Division of Neuro-oncology and of Medicine, was principal investigator. The enzyme IDH1 — isocitrate dehydrogenase 1 — has previously been shown to be mutated in many lower-grade brain tumors and some other cancers. Those mutations, however, are much less common in de novo glioblastoma, an aggressive grade 4 brain tumor, and the most fatal type. Research has also indicated that glioblastoma patients with the non-mutated (or “wildtype”) form of IDH1 tend to have a shorter survival than those with a mutated form. As such, the scientists sought to understand what role wildtype IDH1 might play in glioblastama progression. Using patient samples from both Northwestern Memorial Hospital and the National Institutes of Health’s (NIH) Cancer Genome Atlas Project, the team first demonstrated that non-mutated IDH1 is commonly overexpressed in glioblastoma. Further, the scientists described the mechanisms by which wildtype IDH1 contributes to high cancer cell proliferation, including its involvement in lipid synthesis and the increased production of antioxidants, which leads to decreased cell death. Cells with the enzyme are also more similar to stem cells, making them harder to target with therapies. The scientists went on to demonstrate that knocking down the gene for IDH1, as well as pharmacologically targeting it with a small-molecule inhibitor, slowed tumor growth and prolonged survival of mice with glioblastoma. The discovery has important implications for the development of novel therapies for glioblastoma, which currently has no cure. Andrea Calvert, ’17 PhD, a recent graduate of Feinberg’s Driskill Graduate Program in Life Sciences, conducted her research in the lab of principal investigator Alexander Stegh, PhD. Stegh’s laboratory is currently collaborating with SAMDI Tech, a biotech company that came out of Northwestern’s Evanston campus, to run small-molecule screens on over 500,000 compounds that may directly target the wildtype enzyme. SAMDI Tech was founded by Milan Mrksich, PhD, professor in Cell and Molecular Biology and in the McCormick School of Engineering. The team is also working closely with the laboratory of Chad Mirkin, PhD, the George B. Rathmann Professor of Chemistry in the Weinberg College of Arts and Sciences and a professor of Medicine in the Division of Hematology/Oncology, to develop Spherical Nucleic Acid nanoconjugates to target IDH1. Calvert recently began a postdoctoral fellowship in Stegh’s lab, where she’ll continue her research into glioblastoma and related drug targets. The Cell Reports paper was also co-authored by Marcus Peter, PhD, the Tom D. Spies Professor of Cancer Metabolism; C. David James, PhD, professor of Neurological Surgery and of Biochemistry and Molecular Genetics; Navdeep Chandel, PhD, the David W. Cugell, MD, Professor of Medicine in the Division of Pulmonary and Critical Care and of Cell and Molecular Biology; Ramana Davuluri, PhD, professor of Preventive Medicine in the Division of Health and Biomedical Informatics; Craig Horbinski, MD, PhD, associate professor of Pathology and of Neurological Surgery; Elizabeth Bartom, PhD, assistant professor of Biochemistry and Molecular Genetics; Gary Schiltz, PhD, research professor of Pharmacology; Andrew Mazar, PhD, adjunct professor of Pharmacology; Foteini Kouri, PhD, adjunct assistant professor of Neurology; Yingtao Bi, PhD, adjunct assistant professor of Preventive Medicine in the Division of Health and Biomedical Informatics; and Jasmine May, a student in the Medical Scientist Training Program (MSTP), among other scientists. Stegh, Mrksich, Mirkin, Peter, James, Chandel, Davuluri, Horbinski and Schiltz are also members of the Robert H. Lurie Comprehensive Cancer Center of Northwestern University. The research was supported by the Center for Cancer Nanotechnology Excellence initiative of the NIH under award U54 CA199091, the Alliance for Cancer Gene Therapy, the Dixon Translational Research Grants Initiative of the Northwestern Memorial Foundation, the Coffman Charitable Trust, and National Cancer Institute/NIH training grant T32CA09560.